Anti-Racist Action Against Institutional Racism @ Goldsmiths - Open Access to DTH Now! This petition has been created by Anusheh Y. and may not represent the views of the Avaaz community. 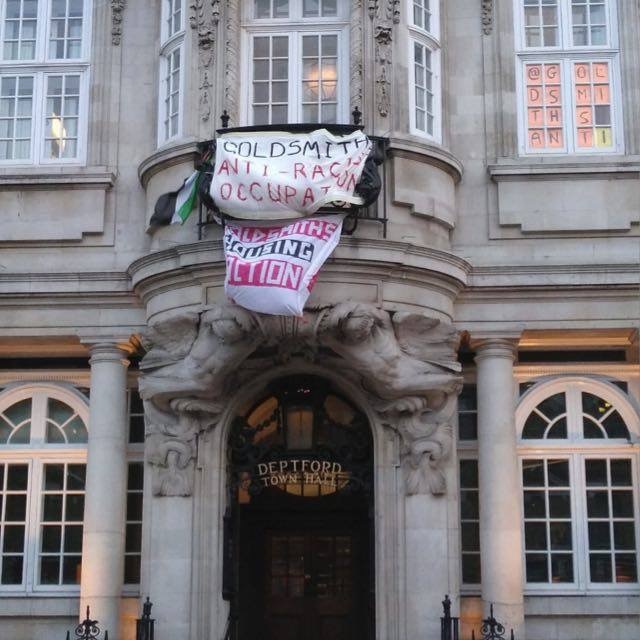 Concerned students at Goldsmiths, University of London, have occupied Deptford Town Hall campus building since the evening of Tuesday the 12th of March 2019, protesting against the lack of anti-racist action from Senior Management. Hamna, a candidate in the Students’ Union elections, had her posters and banner ripped apart, with racist graffiti mocking her accent smeared across them. While the incident against Hamna has undoubtedly fuelled this occupation, we are also thinking of international and racialised students who have been isolated--and died as students--without so much as a formal acknowledgement from the College. The latter’s harassment gone unacted against and subsequently forgotten on campus. Occupiers stand in solidarity with students of colour on campus who face racism, especially anti-Blackness, on a daily basis in the form of microaggressions, insensitive lecturers and seminar leaders, readings that exclude our experiences, and lack of response from authorities concerned. International racialised students face intimidation on a regular basis with being repeatedly confronted with attendance records, wherein a low attendance could lead to deportation. The problem is institutional and complex, its roots infiltrating every area of the College, from its social spaces to its learning spaces to its statues of slave owners on Deptford Town Hall. The brave students are also standing in solidarity with campaigns to bring security and reception staff in-house, as well as with cleaners, who are facing precarious working conditions. They condemn the treatment of cleaners and security guards -who are majority Black, Asian, and Latinx people of colour -as second class citizens, unable to access the privileges that Goldsmiths-employed staff and students can enjoy. The university would not be able to run without its cleaners, security, porters, and admin. This petition is a way to call upon all students to join in protest and occupation, to resist the ironclad coloniality of Goldsmiths that subjugates its BAME students, staff, and workers alike. Whether LGBTQ+, disabled, women or otherwise institutionally oppressed, our struggles are interconnected and intertwined. We will only achieve true, full liberation for all if we boost and listen to the voices of the most marginalised. Until then, #OneGoldsmiths is nothing but a dangerous fallacy.
" 1) The Occupation;We demand: a) Freedom for students to leave and enter the occupation Deptford Town Hall between 9am-7pm.b) As per Article 14 of the Regulatory Reform (Fire Safety) Order 2005 and Paragraph 49 of the ‘London Fire and Emergency Planning Authority Enforcement Policy Statement’, all routes to emergency fire exits must be kept clear and unobstructed at all times. The final exit doors must open easily and immediately, without obstacle.c) Students do not face any disciplinary or legal actions as a result of any involvement in the occupation or associated actions. d) Security staff must not face any disciplinary action as a result of the occupation. 2) Cleaners, security and all outsourced workers should be brought in-house as Goldsmiths staff. We demand: a) We demand there is no delay to the in-housing of the cleaning staff. All cleaning staff must be directly employed by the university by the 1st of May. b) We demand that Goldsmiths officially recognise IWGB as representatives of Security Staff. c) Management must meet all demands set by IWGB to see security staff brought in-house. Sign this petition to show the Senior Management Team at Goldsmiths, University of London, that these incredibly brave and resilient individuals do not stand alone in their views and demands. 4)Racial abuse against Hamna is representative of a wide systemic problem.We demand: An institution-wide strategic plan on how the university plans to tackle racism and the realities of life as a BME student at Goldsmiths: a.This strategy must be launched by June 2019 -ahead of the financial budget being finalised. Failings to do so will result in further escalations, including but not limited to spontaneous occupations. b.This strategy must have clear Key Performance Indicators (KPIs) and clear timelines. The strategy should encompass but not be limited to the following: 1.Public, formal acknowledgement of Goldsmiths’ complicity in increased attacks against marginalised groups on campus. 2. Mandatory training for SMT, Heads of Departments, lecturers, and seminar teachers on unconscious bias as well as teaching and learning. The planning of this involves a collaboration between the college, the BME Academic Lead, two elected representatives of the Students’ Union, two representatives from UCU, two representatives from UNISON, two representatives from IWGB, two representative students from each of the following liberation groups as according to NUS’ structure: Black, disabled, women, trans, LGBTQ+ 3.The curricula must be audited and overhauled across all departments, with emphasis on material that challenges the tradition of Eurocentric, colonial content taught in academia. This must include student-led groups and dedicated paid staff working closely with academics to reflect best practice across the HE sector. 4.Ensure that there are paid BME Department Representatives in each department. 5.An annual fund designated for Black History events for the Students’ Union. 6.Recruitment of a team of full-time staff hired to work with Dr Nicola Rollock and the BME Attainment Gap Working Group on race equality, both at the Students’ Union and at theuniversity. 7.Recruitment of Tutu Foundation to audit racism at Goldsmiths College. 8.Wellbeing and counselling services: Employing specifically BAME staff as well as mandatory cultural competency training to all the current staff in the teams. The demographics of qualified staff should represent and be proportionate to the demographics of the Goldsmiths students’ population. 9.The designated £100,000 to be spent on wellbeing and counselling services is until August 2019. This money should be spent transparently, and Goldsmiths should publish a financial statement on how the money has been spent on their website. We expect this funding to also continue to the next academic year. 10.Increased funding to the chaplaincy services as well as a bigger prayer room spaceto better support students of faith. 11.Goldsmiths must reject the SEAtS Software for its racist, xenophobic perpetuation of surveillance culture which will indiscriminately target international students (particularly those who are BAME). 12.The Hate Crime Reporting Centre: The centre needs urgent reform. There must be a centralised disciplinary system across the College. An adequate review of the policy and processes. The mediation process that is sometimes used for hate crimes and racial antagonization on departmental levels, is inadequate and needlessly traumatic for BME students. For race-based hate crimes, there must be at least one trained BME member of staff in the room. The reporting of hate crimes must be victim led, without necessitating direct confrontation of the perpetrator. A full breakdown of how the £100,000 grant raised through external and internal funding to set up the centre has been spent to date. 5) Contact time for BA Applied Social Science, Community Development and Youth Work degree should be reinstated, where 80% of students are BME and funding is being cut. We demand: a.The reinstatement of contact hours, back to seventeen hours per week, with immediate effect. b.Reimbursement of fees for course, as the conditions of the contract were not met. c.The protection of BME-majority courses and places, specifically the securing of funding and contact hours. 6) Goldsmiths University to contact the Israeli Embassy in London regarding the status of Goldsmiths Alumni Hafez Omar who has been abducted by Israeli Security Forces to apply pressure and demand his immediate release. We expect a written response to each of the points on this list of demands with much more clarity and detail than the previous letter." Sign this petition to show the Senior Management Team at Goldsmiths, University of London, that these incredibly brave and resilient students do not stand alone in their views and demands.